I would like to introduce my sister, Cindy, who has owned a successful small business all her life and how she became a caregiver. Now being a business owner of a small material handling company does not lend itself to developing any clinical skills, but I will say that she stepped up and took on the task of caregiver to my mother and father with great enthusiasm. I might add she had her nurse sisters, Laurie in Tennessee and Carolyn in California, for advice but when it came to the day in and day out of caregiving, it was all Cindy. This was not an easy task; my mother had taken a fall and had the typical long hospitalization that can occur with the elderly. Mother became deconditioned and progressively worse during her hospitalization but her wishes were to be at home. Initially, Cindy had the help of home healthcare services but being in the home healthcare industry, I knew this was intermittent care and not meant to last. The home health team was great but only there for an adjustment period. Cindy and Mom were in this for the long haul. One of the first things that we did was to research private duty/personal care companies that could educate and be of support to Cindy locally as she learned to care for our very ill mother. My sister Carolyn and I knew the constant stress that caregivers are under and we wanted to make sure that Cindy had some help as she made mother safe and comfortable at home. The personal care company we utilized was a valuable asset in my mother’s care. Don’t think for a minute that you can do it all yourself. One thing Cindy learned is to ask for help before she became “the patient” herself. 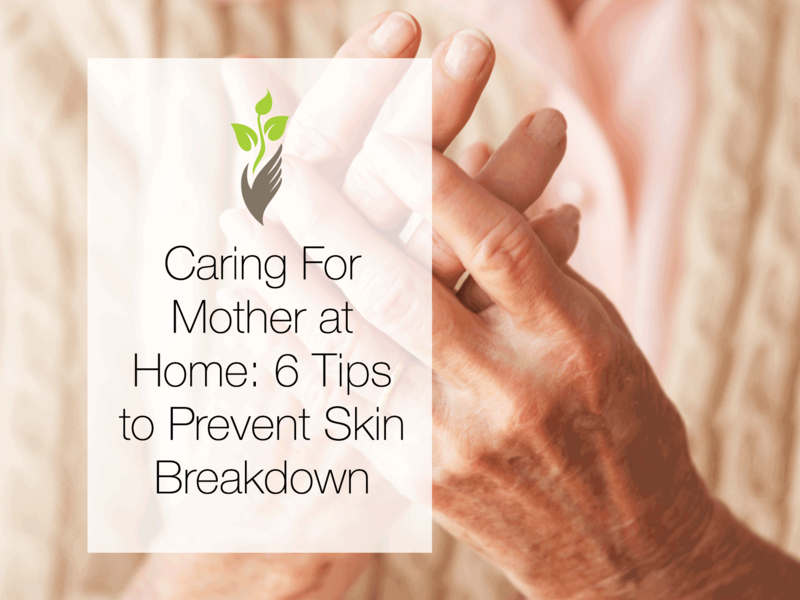 I asked Cindy to share some insights on this blog that she learned over the years of caring for our parents, and skin care was the first thing she wanted to discuss. We hope this series of personal experiences is helpful to you! Skin Care: Tips to Prevent Breakdown. Your loved one is at risk of developing decubitus ulcers (pressure sores) if they are having difficulty moving and changing their position. Be on alert if your loved one sits for long periods of time in a wheelchair or spends extended periods in bed. Use positioning cushions: There are lots of different positioning cushions and surfaces available. You can protect your senior loved one’s bony areas with good positioning and cushions. For example, instead of lying directly on a hip, lie at an angle with cushions supporting their back or front. Keep nails short and clean: An issue that I have found to be of utmost importance is to keep their nails short and clean, as one scratch could give them an infected wound or skin tear. Check toenails also. In fact, have them wear socks as it not only keeps them warm, but it also lowers the chance of a skin tear from a toenail. Daily use moisturizing skin products: Utilize moisturizing skin care products daily, and after their bath check out the skin for any thin, fragile spots. It is important to do a thorough skin assessment daily, including the heels. Liberally use protective zinc cream: The constant cleaning and diapering is hard on the skin. A thick paste of moisturizing zinc cream should be applied to the buttocks area to avoid burns from urine. And it should be reapplied after every change. I’ve found that the best type of product for this situation is an extra-protective zinc cream typically used for the prevention of diaper dermatitis associated with the exposure to feces or urine. Encourage fluids: Make sure your loved one stays hydrated with fluids throughout the day. Healthy skin relies on adequate fluids. Water is the best choice. To make it go down easier try squeezing fresh lemons or limes in the water this will also increase their Vitamin C intake, which will help support their immune system. The Mayo Clinic website recommends 1-2 liters a day. It is important to note, however, that fluid intake requirement varies from person to person so be sure to consult your physicians in order to determine the appropriate amount of fluid consumption. Be mindful of protein intake: Provide an appropriate amount of protein choices. Protein keeps skin elastic and healthy. The needed amount of protein varies depending on activity level and those on bed rest or in a wheelchair may need slightly less. Thus, be sure to consult your physician to determine the appropriate amount of protein consumption. These 6 tips will help prevent skin breakdown. They have worked for me! Visit our Family Learning Center, a library of free online courses to help you care for your elderly loved one.